Mrs. O’Brien: You’ll be grown before that tree is tall. 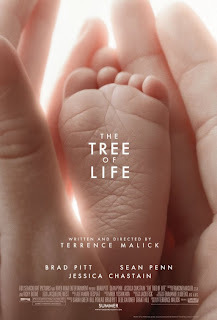 Terrence Malick’s THE TREE OF LIFE is the most polarizing film I’ve seen in ages. It was widely reported that plenty of patrons walked out and angrily demanded their money back while just as many fans vehemently defended it, proclaiming the film a modern masterpiece. In fact, this pattern began at the Cannes film festival, where the film made its debut, when half the audience took to its feet in ovation while the rest booed and hissed loudly. To be fair, Cannes audiences do tend to err on the dramatic side of things but this divide was very real. No word of a lie, I hold THE TREE OF LIFE personally responsible, at least in some small part, for actually ruining a very close friendship of mine. It doesn’t matter which side of the line you fall on though; what matters is that for those who see it, the reaction it inspires is a strong one. All I knew after seeing THE TREE OF LIFE in theatres was that I would need to see it again to truly form a full opinion of it. I knew that seeing it again would either leave me feeling more detached from it or more involved in it. When I saw the film with an audience, I was surprised and moved by how quiet and attentive everyone was. The film demands your attention and it certainly had it in that room. A few people left, including the couple sitting in front of me. (I knew when they sat down that it was only a matter of when.) At the time, my original review praised the film’s aesthetics, calling them nothing short of genius, but I also felt the film came across as somewhat self-important, as if Malick portended to know something we didn’t. After seeing the film again, in stunning high definition in my living room, I feel as though I have seen THE TREE OF LIFE in a whole other light. The film is an odyssey of sorts, one that the viewer must choose to embark upon freely in order to enjoy. At two hours and eighteen minutes, the film is not particularly long but it can feel that way at times because it requires such delicate contemplation on the viewer’s part, as well as some very focused observation. It’s almost meditative. If you can find that state of balance and calm that Malick mysteriously manifests on film though, the experience itself can be transcendent. Every frame of this film is magnificent, bursting off the screen with beauty like you’ve never seen, rendering the action taking place superfluous most of the time. There is no succinct plot in THE TREE OF LIFE. Having one would almost defeat the point, or at least the new point I’ve taken away from the film anyway. I feel more now as though Malick is not telling us what he thinks he knows about life but rather asking us to see life as the splendid miracle it is, to appreciate it fully and to understand that not only could it disappear in an instant but that one day it will. And so instead of story, Malick gives us random moments, some mundane, some meaningful. Moments are what make up our lives and from these moments, spring the stories we create in our minds. We invite shame and suffering into our homes and into our bodies when we don’t need to. Our lives are but blinks of an eye and all that we should see in that instant is love. How many sheep would you give The Tree of Life? Great. Really helped put the films content into some kind of perspective. Have seen once in cinema and was shocked at how quick the audience was to ridicule when credits rolled. Can’t wait for a second view. Thanks! I found the second viewing really helped me see the film in a different light. I connected more with it as well. Maybe it was the intimate setting of my living room that did it. Such a gorgeous film.